Dr. James Hoffmann is an Ophthalmologist who specializes in “No-Stitch” Clear Corneal Incision Cataract Surgery and Laser Cataract Surgery. 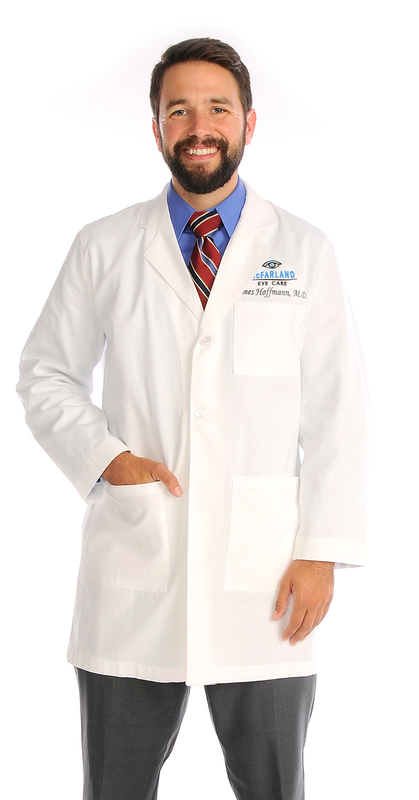 He also offers a variety of ocular care to our patients in Pine Bluff, Hot Springs, Bryant and Little Rock clinics. Dr. Hoffmann is a native of Siloam Springs, Arkansas. He realized his passion for Ophthalmology after a medical mission trip to Guatemala in 2011. Once he discovered how the practice of Ophthalmology – and specifically cataract surgery – has the potential to make such a dramatic impact on an individual’s quality of life, he knew that’s what he wanted to pursue. Soon after, he made Ophthalmology his emphasis and now enjoys caring for patients daily at McFarland Eye Care. In his spare time, Dr. Hoffmann loves to travel – most recently backpacking across Southeast Asia. He also enjoys reading, scuba diving, fitness, hiking, snow skiing and other outdoor activities. He is committed to community involvement and global eye health outreach. He has volunteered with a number of organizations including Our House, Shepherd’s Hope Clinic and Sight Savers Clinic in Little Rock, as well as worked in medical missions in Guatemala and Swaziland.